The Allentown Center City Initiative Education Subcommittee has been studying the challenges and triumphs of education in Allentown with an eye to how education can contribute to dynamic, prosperous, and safe neighborhoods. While the number and breadth of existing education improvement activities are truly meritorious, we believe that only a public education system that prepares each and every child to be the very best he or she can be will be adequate to achieve our vision for center city. That will require a major rethinking of education as we know it. Fortunately, a few pioneering schools have demonstrated a very different way of educating called “deeper learning” that is fully attuned with today’s economy and society, and can be a model for us. We are hosting a Community Forum on Wednesday, June 24 at 5 pm at the Conference Center at Sacred Heart Hospital. It is intended to help us all better understand how the world has changed, the growing shortcomings of traditional education for this new innovative world, and the best practices available to reinvent education for today’s world. That information will be presented mostly through a new movie called Most Likely To Succeed. This powerful movie, featured at prestigious shows including Sundance and Tribeca, will help you understand the issues around education in a way very few do today. People with knowledge and experience about deeper learning will be present to answer questions and clarify points. Once we raise our level of understanding and possibility, we want to begin a community dialog about what all this means for us and what we can do together to realize a transformation of our center city and our community. In today’s talent-driven economy, where can a truly effective education system take us? What would it look like? What goals must education satisfy to achieve that vision? Who can help us get there? Allentown already has a start with the new Building 21 high school initiative. What other things can we do to insure that those goals are fully satisfied and that the transformation spreads completely across our education system? The committee believes that education, a very different kind of education, is the only vehicle we have capable of being the equalizer that enables and prepares all the people of our community to both contribute to and benefit from a dynamic, prosperous, and safe Allentown. We encourage all who care about our kids, our education system, and our community to join us, get up to speed on the issues, opportunities, and language, and share perspectives on what we (together) can do to realize this vision. Come to listen, learn, and commit. If enough do their part we can do this! 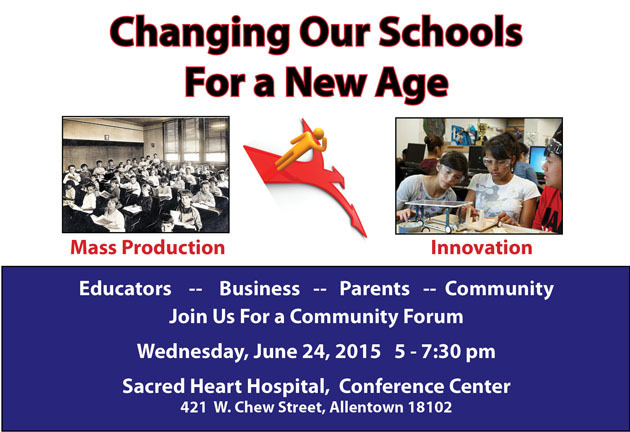 The Forum is brought to you by the Allentown Center City Initiative Education Subcommittee, with thanks to Sacred Heart Hospital. For further information contact Mark Lang at mark@markslang.net or 610-691-8459.